I have done much research about everything from the 911-coverup to the dangers of vaccinations. I have literally spent thousands-upon-thousands of hours seeking for the truth. I own well over one thousand books and booklets. The TRUTH is the TRUTH even if no one believes it; and a LIE is a LIE even if everyone believes it! I love to teach. I love to share with others the things I have learned in hopes that their eyes will opened to the truth. Unfortunately, MOST people that I speak with don't want their eyes opened. It's a curse upon America, people don't like to face the facts. People don't like to leave their comfort zone. No one who is comfortable likes change. This is called “complacency” (i.e., being contented to a fault, being self-satisfied without concern). 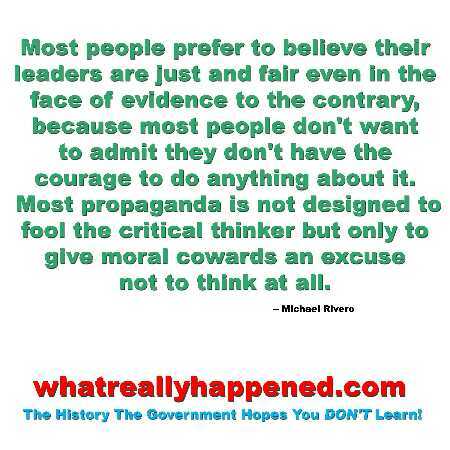 The average American is a lazy thinker, often critical of others who do think and stand up for what is right. Every individual is the gatekeeper of their own mind. If a person doesn't control their own mind, then someone else will. 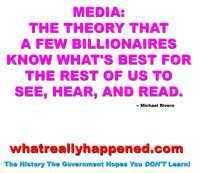 This is why the American public has been so dumbed down. This is why teens today listen to the most immoral, blasphemous and demonic music. This is why Americans sit in front of their TVs being corrupted with every form of filth and wickedness. We are living in evil times, when greedy people are willing to stoop lower than low to sell a record. The same holds true for things we see over the internet or on TV. I hear people often say “You can't believe everything you find on the internet.” If you have even a little sense and desire to know the truth, then you are aware that the internet is the BEST source of accurate news available. The major TV networks and CNN are all highly monitored by the FCC (a government department). 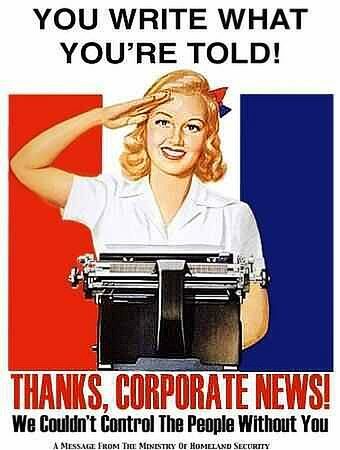 All of the news we hear on TV is censored, edited, distorted and watered down. When someone does slip some truth in (like Dan Rather), he gets castrated by the higher powers. Telling the truth has always brought persecution. Jesus said in John 8:45, “And because I tell you the truth, ye believe me not.” The Apostle Paul said in Galatians 4:16, “Am I therefore become your enemy, because I tell you the truth?” The truth has never been popular. There is a certain amount of controlled opposition allowed in the mainstream newsmedia. Glenn Beck and others are beginning to talk about the New World Order, but this is a ploy to discredit those who address the real problems in America; such as the hellish criminal Federal Reserve Banks (which are privately owned, evil to the core, and no longer have any gold reserve). They are the worst thug gangsters! I hear Baptist preachers scolding Americans for wanting salary raises, but they are woefully ignorant that Americans have been sold out by our leaders. Tens-of-millions of higher paying manufacturing jobs have been eliminated, relocated to foreign soil instead, leaving Americans with only minimum wage jobs. For example: Years ago Motorola laid off 10,000 American workers and relocated those jobs to Beijing, China. This is TREASON!!! Stewart Warner, Maytag, General Motors—these U.S. companies and thousands more have all laid off American workers to exploit cheap foreign labor. It's disgusting to hear a billionaire financial broker like Peter Schiff blame the U.S. government, when he profits greatly from every bit of this betrayal of the American people, which is treason. U.S. corporations control the U.S. government, not vice versa. The culprit is the Luciferian Council On Foreign Relations (CFR), corporate greed, the criminal Federal Reserve banking system (i.e., the international banksters), Freemasonry, the corrupt government leaders who cater to them, and the occult-driven Communist system that is overthrowing the American republic. These are all part of the now-forming satanic New World Order. Anyone who goes along, displaying popular occult symbols (i.e., the All Seeing Eye and The Great Pyramid) prosper in this Devilish world. I hate the New World Order and am going to continue to expose it for the sinister evil that it is. The average American citizen is woefully complacent, living comfortably, and couldn't care less what is going on in Washington D.C.! There's a saying that goes: “If you give the Devil an inch, he'll take a foot, and become a ruler.” Well, the federal government has become that devilish ruler because we let them have an inch of power. The arrogance of the American government will be their downfall. The world hates America because of our criminal government that oppresses the world, butts in everyone else's business, and murders millions of innocent foreigners (like the 1,455,590 Iraqis murdered by the Bush administration). Proverb 16:18 declares “Pride goeth before destruction, and an haughty spirit before a fall.” America is headed for a great fall. The American people are woefully blinded by sinful pride, duped by the Devil, boasting of their value for life while brutally murdering tens-of-millions of precious children by abortion. While churches are being persecuted by police for knocking on doors to invite people to church, the police couldn't care less about the thousands of human beings murdered each and every single day in the United States by abortion. We have become a stiff-necked people, turning a blind eye to the blatant evils being committed by our own government. I wish every American would have lost their life's savings and retirements like those unfortunate Enron employee's did. Why? Because then there would have been enough angry victims to bring about justice. Instead, the ruling elite laugh, saying, it's “JUST US!” This is the type of iniquity which Jesus spoke of in Matthew 24:12, “And because iniquity shall abound, the love of many shall wax cold.” The word “iniquity” here means “unpunished evil.” Jesus was not referring to sin, but to unpunished sin. We are living in a generation of woeful wickedness, wickedness which has spanned generations going back to the Revolutionary War. The treasonous Federal Reserve Act of 1913 signified the death of our nation's economy, which financed World Wars I and II. Literally, the international criminal banking cartel used our own money against us, killing 20,000,000 people just in World War I and sticking Americans with a massive war debt. It was occult Freemasons who founded America, with the intent of bringing to fruition a New World Order. Benjamin Franklin was a known Satanist, a key member in the Hellfire Club. Truth is certainly stranger than fiction. The Hellfire Club was no ordinary club. Located deep beneath the disguise of an innocent looking church in England, members of the Hellfire Club descended hundreds of feet deep into the earth; into a series of excavated tunnels, rooms and caverns; where members fornicated with prostitutes; and occult sacrifices were offered to Satan. In February of 1998 the remains of 10 bodies were found behind a wall in Franklin's home. Those Enron employees were cheated out of their life's savings while the government and the rest of America could care less. Very few people raised a ruckus, not enough to make a difference. That's what America desperately needs, for millions of U.S. CITIZENS to raise a ruckus! What is a ruckus? Glad you asked. A "ruckus" is "The act of making a noisy disturbance." This is our First Amendment right, to peaceably ASSEMBLE and PROTEST our government. So why aren't more Americans exercising their right? Sadly, because they don't care, they have become indifferent. But you say, “You can't believe everything you read or see over the internet.” No, but you're a complete idiot if you don't believe any of it. Think about it, everything you believe is the result of things you have either seen or heard (things you have perceived through the five senses). So using your argument, I guess we just shouldn't believe anything. What is truth? Who decides what is truth? It is our individual duty to our country, and our personal responsibility to God, to do our best to seek and the truth and to act accordingly. The average personal is so enamored (marked by foolish or unreasoning fondness) with the sinful things of the world that they couldn't care less about God. Is it any wonder why Christianity Today Magazine (CT) endorses the hideous demonic Harry Potter series. I mean, when you have professed “Christian” organizations promoting witchcraft, you know a nation is far gone spiritually. I wasn't surprised when the Pope endorsed Harry Potter, but Christianity Today? Sad, very sad. CT also supports homosexuality, calls God a “drama queen,” and recommends AVATAR which curses in God's name. CT also thinks the demonic Pan's Labyrinth is a great show, showing an innocent little girl falling in love with the sexual-deviate, pagan god, Pan. CT has hit rock bottom! Most people don't want to believe that 911 was an inside job. This would make them VERY UNCOMFORTABLE. After all, if they did believe such a thing, most of their family and friends would think they were a nut, a conspiracy theorist. Did you know that Jesus was crucified upon the cross as the result of a CONSPIRACY against Him by the Pharisees? Yes, it is true. The evil Pharisees (Jewish religious leaders of that day) hired Judas (one of Jesus' disciples) in an evil plot designed to kill our Lord and Savior. A "conspiracy" is a group of people (at least two) who plot to carry out a harmful or unlawful act. There have been conspiracies by the billions throughout history. One of the biggest lies ever fabricated was that there are no conspiracies. Folks, conspiracies are an inherent part of mankind's sinful nature. Anytime two or more people get together and plan to do wrong, they are conspiring. Why is it so hard to accept the word CONSPIRACY? The deaths of 2,752 American citizens on 911 was the result of a diabolical conspiracy involving the Bush family, the Bush Administration, the Bin Laden family, the global billionaire elite, and others. Only a fool who is wearing blinders would say that the Bush administration wasn't involved in carrying out 911. It was president Bush who signed Presidential decision directive W199-eye to protect the terrorists. It's been in every publication from the Wall Street Journal to the Washington Times. I guess you can't believe this either. No legitimate investigation has ever been done into what really happened on 911. That in itself is damning evidence against The Bush Administration, CIA, FBI and other Harvard and Yale graduates. They're all in bed together. Harvard and Yale are breeding grounds for the New World Order. Why would George Bush sign presidential directive W199i to block the FBI and defense intelligence from investigating the terrorist? Several FBI and CIA agents have actually filed lawsuits against the Bush Administration for obstruction of justice and abetting terrorists (their lawyer is nationally known, David Schippers). David Schippers is right, he said "Once you've had license, tyranny is next." What is license? "License" is "Freedom to deviate deliberately from normally applicable rules or practices; Excessive freedom; lack of due restraint." President George W. Bush signed legal documents to protect the terrorists... It's the smoking gun of 911. Wake up sheeple! John O'Neill, former FBI Deputy Director resigned because he felt that the U.S. administration was obstructing the FBI and their attempt to stop Al-Qaeda. Why doesn't O'Neill go public now? He was murdered! John O'Neill started his first day on the job as Security Director of the Trade Towers in New York City, and was killed that very same day... 911! These criminals are so blatant. God will judge them for their evil deeds. And what about World Trade Center building 7, it was never hit by a plane. So why did it perfectly crumble to the ground on the afternoon of 911? It took just 6.5 seconds. 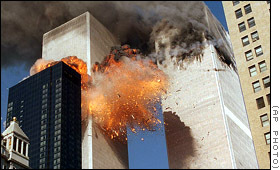 In fact, the building didn't fall until 23 MINUTES AFTER the BBC newsmedia had reported that it had fallen. No kidding! The building's owner (Larry Silverstein) admitting publicly in an interview that he was asked for permission to "pull" his building ("pull" is the slang term commonly used by demolition crews to detonate a building). Silverstein took out an insurance policy on the WTC buildings for billions-of-dollars in the months prior to the 911 attacks. They pulled his buildings alright, including World Trade centers 1 and 2 as well. How does 2 planes bring down 3 buildings? Did I mention that Wargames were also used on the day of 911 as a cover for the real attacks. If that's not convincing enough, probably the most damning evidence of all is the giant Masonic All Seeing Eye at ground zero today at the 911 Memorial. In your face America! They even boast in our faces... YEAH, WE DID IT, AND THERE'S NOTHING YOU CAN DO ABOUT IT! Do you here laughing Raamses? (that's a line I remember from the 1956 movie, The Ten Commandments). The elite Globalists are laughing at our stupidity and weakness. The engineer who designed the Trade Towers (as well as architects from around the world) have stated that the Trade Towers were designed to withstand a plane impact. The evidence is overwhelming that those buildings on 911 were demolished by the use of carefully positioned bombs throughout the buildings. And we know for a FACT that building 7 was detonated. Oh year, and George W. Bush's young brother, Marvin Bush oversaw the electronics security on the Trade Towers complex in the 2-years leading up to 911. I couldn't make this stuff up if I tried. I could go on for hours. The things I have just shared with you are FACTS, not conspiracy theories. You can't just blindly brush it all away. The official 911 story has been proven a hoax. You can't just say "You can't believe everything you read." I beg you as your fellow American CITIZEN to at least investigate the FACTS and be honest in your heart. I am disgusted at the excuses I hear from people all the time. I recently told a man about Congressman Ron Paul and the HUNDREDS of articles which Dr. Paul has written exposing the coming police state and violations of our constitutional rights. The man simply invalidated Ron Paul by saying that all politicians are liars. Do you see what I mean? People who have never spent even ten minutes investigating the truth will just arrogantly and foolishly explain it all away with some ridiculous copout statement. Anyone trying to expose 911 who is selling something is being discredited. Folks, just because someone is making a buck off something doesn't mean it's a lie. Granted, there is cause for concern. I would certainly be leery of anyone who stands to gain profits by selling as book. But keep in mind that even good books are sold in bookstores. I personally hate money, don't want money, and have never made a penny from my labors in the Lord. This is a labor of love. My rewards are in Heaven (Matthew 6:20). How do you know THE TRUTH unless you've investigated it, read the books, watched the videos, and spent some time thinking things through. It's much easier to accuse people of "saying anything for money." Alex Jones does sell his videos, but he openly tells ALL his listeners and customers to make all the copies they possibly can and distribute them freely. I know Alex doesn't get into rumors or unfounded allegations, he sticks to facts in the news. These are facts that ANYONE can easily verify. The TRUTH is the TRUTH even if no one believes it; and a LIE is a LIE even if everyone believes it. Although I like the Fahrenheit 911 Video by Michael Moore, Alex Jones' 911: The Road To Tyranny is much better in my opinion. Michael Moore is pro-Democrat and pro-abortion. He's a part of the problem because he promotes the Godless Democrats (which are as corrupt and evil as the Republicans). Michael Moore is simply leading people to an equal evil. 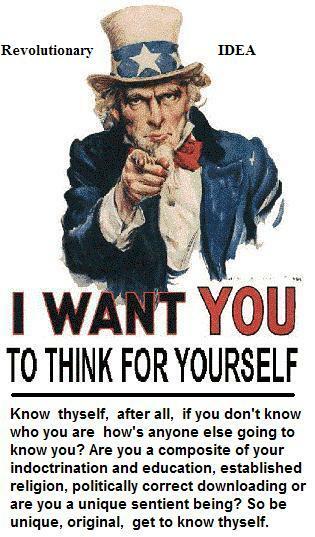 America needs a revival of thinking for ourselves. Thank God for Congressman Ron Paul who is a friend of the American people. Congressman Ron Paul is also a doctor, having delivered over 4,000 babies in his career. He certainly does not need any money from being a congressman. So why would Ron Paul stick his neck out writing article after article exposing the evil Bush administration, condemning the war in Iraq, calling for abolition of the Federal Reserve Bank, et cetera? Rep. Ron Paul is a great man of principle, defending the Bill of Rights and the U.S. Constitution. Every American should rally around Ron Paul, but they're too far from God to care. You see friend, wickedness always breeds indifference (apathy). First it was Al Qaeda that was the terrorists, then it was Tim McVeigh, now it's Ron Paul supporters! This is how tyranny operates. In Matthew 24:12 Jesus said, "And because iniquity shall abound, the love of many shall wax cold." People have become COLD-HEARTED! Immorality is everywhere. Sin kills! Sin separates! As America's love for sin continues, so our nation plunges further into debt and farther into the abyss of a moral meltdown. SIN CITY is death city! We are losing our country and our freedom. Those who will not govern themselves must be governed. As our nation becomes increasingly immoral, and neighbor rises up against neighbor, it gives the criminal elite the perfect excuse to build a Police State up around us. 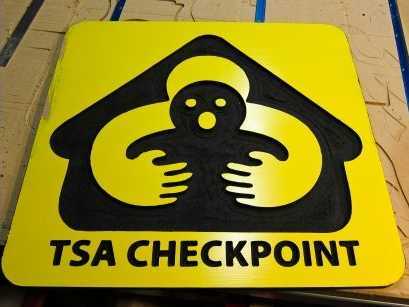 And now they're sticking their hands in our pants at the airports! You need to believe some of the things you read my friend, because we are in a pot of water that is headed for the boiling point. By the time the blinded, complacent, careless, irresponsible, immoral, and arrogant American people realize what is really happening they will be slaves to the New World Order. The police state is coming. Surveillance cameras are popping up everywhere. The interment camps are already here. The Government is recruiting your neighbors to spy on you. America is headed for massive bankruptcy. Social Security WON'T be there for you. 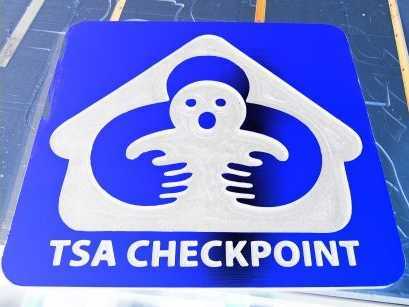 You're children are about to be forced to undergo mental-screening. And to top it all off, we've got a heathen phony for President of the U.S.
Wake up sheeple! It will be too late. The storm clouds are gathering. The dots are in place and the lines are being drawn. The beast system is being set up for the Antichrist. The pre-tribulation return of the Lord surely cannot be far away. Jesus told a parable about ten virgins. Five were wise and five were foolish. Matthew 25:3 reads, "They that were foolish took their lamps, and took no oil with them." The five wise virgins brought oil with them, anticipating the possible arrival of the bridegroom during the night. The other five foolish virgins didn't care, they brought no oil. When the bridegroom came at midnight, the five foolish virgins couldn't see their way and were left behind. Are you one of those foolish virgins in the Bible who have no oil? That oil my friend is the Holy Spirit of God. You need to be born-again if you want to go to Heaven. Nothing will matter 100 years from now accept what you do with Jesus? BELIEVE that Jesus is the Son of God, the Christ, and trust upon His name to be saved (John 20:31). Will you someday die in your sins and be cast into the lake of fire? Or will you die in the Lord Jesus Christ and go to heaven as did Lazarus, escorted by angels to his new home beyond the sunset? Going to heaven is very easy. It won't cost you a penny. You don't have to go to church. Salvation is a free gift, paid for by the literal shed blood of Jesus Christ. "Except a man be born again, he cannot enter into the kingdom of God" (John 3:3). If you would like to be saved, then come to the forgiving Savior as a sinner for forgiveness. (an unconstitutional 4TH branch of government and how it is being used to steal your children ).